The Gateway Mall Master Plan 2009 sets the framework for the revitalization of the Gateway Mall. The plan is primarily an urban design framework and landscape architecture plan, with the primary focus being around the use and access of spaces and their design. It is assumed that this would have been the result of the project brief, as the reasons for the failure of the Mall go far beyond mere use and design components – something that the plan fully acknowledges. Unlike Downtown Next, this plan was consultant driven so an analysis must consider not only the content of the plan, but also the wishes of the client. 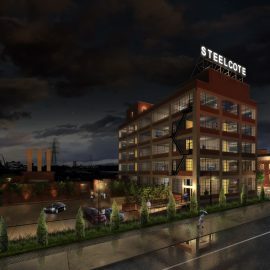 Who the client is, in this case, is somewhat unclear, as the project was funded by the Gateway Foundation and delivered to the City of St. Louis Planning & Design Agency. Still, it is established that the civic leaders refuse to consider allowing the Mall for commercial/residential development, so the consultants certainly wouldn’t have been able to offer up those types of suggestions. While addressed, policy issues regarding street vendors, event applications, monitoring and policing, and other issues that affect the mall are not given a robust exploration. Only a few paragraphs address these issues in the implementation section. It is thus assumed that this was beyond the scope of the brief as well – despite being frequently cited as a major issue. This in itself is quite frustrating because there is little reason to pay someone $450,000 (the reported cost of the study) to tell you what you want to hear. It would have been ideal to see a section in the plan about the project brief they were given to measure how they responded to it, but alas. Just briefly in regards to the cost of the study – $450,000 is an astronomical amount for a land use and urban design plan, even one as comprehensive as this. The cost may have something to do with seven sub-consultants credited in the plan, as well as the fact the lead consultant is based in Toronto. While it is easy to say ‘spare no expense’ for a great plan, the cost/benefit of such a pricey document is questioned. Certainly, half the money could have been spent on other needed plans, strategies, or capital works. In comparison to Downtown Next, the GMMP fully appreciates the problems and issues affecting the Mall – even if it can’t address them. It acknowledges that the Mall serves to divide the city, rather than unite it, that its design is ‘bland’ (p. 12), that the mix of uses surrounding it are not active and too far set back from the street. This is the first and an important step to solving the ‘mall problem’. In fact, perhaps the most understanding photo is on p.17, where an aerial shows the desolate blocks just west of the Gateway One building – where even one block appears to be too much space for even itself. Overall, the plan (for what they’re able to address) is quite solid, though there are considerable areas of concern from a design and land-use planning sense. Beginning on p.24, we start with a street plan of Market and Chestnut at any typical intersection. Clearly, the existing is barren, and the proposed has far more greenery. But if one looks closer, the consultants have proposed eliminating on-street parking on the north side of Market for bi-directional bike paths, while maintaining 5 lanes of traffic for Market. Ignore for the moment that bicycle traffic in downtown at the moment is at best sparse – the consultants acknowledge that Market Street’s width is a barrier. Eliminating parking for cycling does nothing to reduce the street width, plus it will likely raise vehicle speeds on Market. It would be more productive to maintain the on-street parking lane, and have a bike lane on either side of Market, allowing for left turns only at intersections and reducing the overall size of Market down to four lanes. The rationale of ‘reducing the visual barrier from the city’ (p.25) is weak. Many cities allow parking along major parklands with few visibility problems. The proposal to block off Chestnut St for three blocks in front of the Soldiers’ Memorial is not necessary and likely a detriment to the area. Throughout the history of America, streets have been blocked off for pedestrians, and rarely if ever does it result in a positive outcome (see North 14th St in ONSTL, Neil St. in Champaign). While I appreciate the idea of making the area surrounding the Soldiers’ Memorial the ‘primary’ event space, this does not require the permanent closure of Chestnut. A simple change in pavement to delineate a shared space between uses and a narrowing of the street to create one lane in each direction, with parallel on-street parking (instead of the 45 degree currently) would allow for similar uses to take place while maintaining the important aspect of street life and activity. Retractable bollards can be placed at either end of the street for events. This may cost more than simply shutting down the street, but it would likely result in a better outcome. Continuing, these blocks would still be separated by 14th & 13th Streets, which are 5 lanes wide each (with 45 degree parking). Both of these streets should also be narrowed and given a similar treatment as suggested to realize the full benefit. Otherwise this will simply be three large green spaces separated by roads, and not a recreational/cultural district, which appears to be the goal. Continuing, the concept of the ‘Hallway’ has merit, but only so far as the length of the mall itself. The plan suggests extending this hallway beyond the scope of the document (by its own admission) and onto the Old Courthouse through to the Arch (p.28). Given that the Hallway proposes to be a sidewalk with large canopy trees, this has the potential to compromise the views and vistas of the Old Courthouse and the Arch from the west looking east. While the plans on p.32 don’t indicate there to be any planting alongside the OCH (and there’s little room for it anyway), it would not be prudent to add canopy vegetation beyond Kiener Plaza. Kiener Plaza itself is proposed to have a comprehensive design makeover, which the rationale is again questioned. The issue with Kiener is not the design; it’s the level of activation. A cursory glance on a nice day will see dozens of people using the space, for lunch, kids playing in the waterfall (probably not the cleanest thing to do but still), others taking pictures of the OCH framed by the Arch, or just sitting. The amphitheater is occasionally used, but rarely, and if memory serves there is a hot dog vendor but nothing else. A redesign for something more modern will not make people use the space any more. A simple matter of more shade structures, a good cleaning, and an aggressive campaign for people to use the space (street performers, food stands, events) will be far more cost effective. The GMMP has some considerably good ideas as well. Obviously, history tells us that City Garden has been a considerable success. It is difficult to critique it within this plan, mostly because it appears that the consultant was told to include this. The map on p.36 completely lacks detailed explanation as to what’s going on, indicating that it was a foregone conclusion from a client perspective. 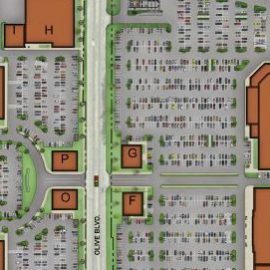 The sheer size of the Mall comes into play (literally) when the plan attempts to tackle the 3 blocks west of 14th to 17th. At this point of the Mall, there is very little surrounding it. The plan has focused heavily on the nearby residential component of Plaza Square, more out of necessity it seems than by desire. Having focused on event spaces (Kiener/Civic), and thoroughfare (Hallway), the last option for green space is passive/active recreation. The ‘Neighborhood Room’ comprises a playground, beach volleyball (not sure how much that gets used in winter), a dog run, and multi-purpose sport fields. While there are safety concerns about playing ball sports just a few hundred feet from moving traffic, it’s a bold, creative proposal that brings something totally new to the area. Here the proposal of closing 17th is logical and necessary to the objectives. The only issue is that they’re counting on a considerable residential population to be able to activate this space. 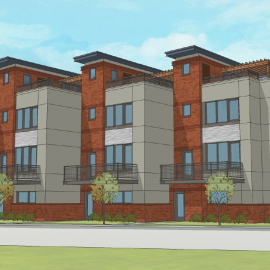 Given that the focus of the city on residential development is in Washington Ave (and just about nowhere else), so much space dedicated to residential-type uses will go underutilized until a sufficient residential population in the area has been achieved. This could take decades. The end of the Mall is treated like, well, the end. The proposed design is a large mound that blocks off the view further west to the unsightly portion of Downtown West. 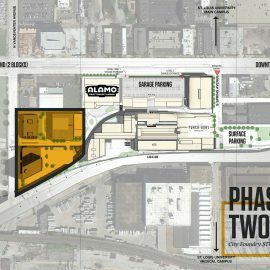 Having literally master planned every square foot of the previous 16 blocks, it appears that the consultants felt obliged to fill the remaining two with something, so here they’ve added a skate park (which is needed in the Downtown St. Louis area), and maybe another dog run (among other potential uses). It’s not exactly the most visionary recommendation, but then the area doesn’t give a lot to work with. Still, a hill here is not appropriate. The mall should work to integrate Market towards Downtown West, not set up another barrier. All things considered though, given the brief the consultant likely had to work with, they delivered a fairly solid plan. The Gateway Mall is 1.2 miles of nearly vacant land – creating design and land use solutions for each inch of it are extraordinary tasks. The GMMP understands the issues, provides interesting solutions to complex problems and gives guidance to future management/funding issues. 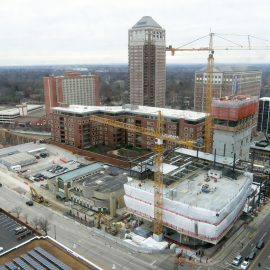 While the recommendations of almost literally building a wall to Downtown West, reducing on-street parking, and investing tens of thousands of dollars into a family-friendly area when there is not a clear plan to dramatically increase residential dwellings in the immediate area are certainly curious, these and any other shortfalls in the document are ultimately the responsibility of the client who accepted the work. Sometimes derided for having planning documents gathering dust on a shelf, St. Louis may or may not have a profusion of development plans. But like proposals from developers, or retail openings and closings, it seems that a lack of action is worse than too much. Having plans is good, revising plans, proposing developments over and over again is better than the alternative, and likely reflects the vitality of ideas we seek. However, as a community we are lacking in the examination of these plans and proposals. Have you ever read a thorough critique of the Forest Park master plan? What about Midtown? Lafayette Square? Old North? nextSTL was the only place to find exhaustive exploration of the Arch grounds finalists designs. In that spirit, we hope to examine existing plans in St. Louis. We began with Downtown Next, the 2009 Gateway Mall Master Plan is the second. Dan is a Strategic Planner for the City of Greater Dandenong, a southeast suburb of Melbourne, Australia, where he is developing and implementing economic development strategies for local business districts. He is a graduate of MICDS in St. Louis and earned a BA in Urban Planning from the University of Illinois-Urbana/Champaign.